RS Berkeley ob402 Artist Series Oboe with case & Bonus RSB MEGA PACK w/Essential Elements Book by RS Berkeley at Way North of Nashville. Hurry! Limited time offer. Offer valid only while supplies last. 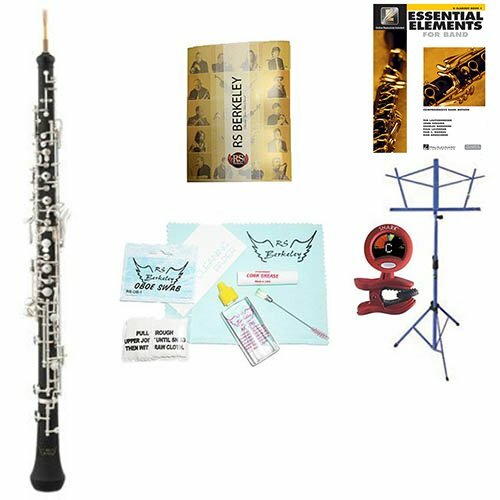 OB402 Artist Series Oboe with Case, Oboe Care & Cleaning Kit, Music Stand, Band Folder, Essential Elements Book 1 for Oboe, & Tuner & Metronome. OB402 Artist Series Oboe with Case, Oboe Care & Cleaning Kit, Music Stand, Band Folder, Essential Elements Book 1 for Oboe, & Tuner & Metronome. OB402 Artist Series Oboe features a full conservatory key system and a range to low Bb for the advanced player. The high quality resin body resists cracking and offers a consistent intonation. The precise professional keywork is smooth and comfortable to the hands. Beautiful tone, even scale, and great projection make the Artist Series oboe an exceptional instrument for advanced players. Additional key features include left hand F key, F resonance key, auxiliary C, and C-D trill keys. The Oboe has Silver plated keys, tapered pivot screws which allow precise adjustment and blue steel springs. Oboe Care & Cleaning Kit, Music Stand, Band Folder, Essential Elements Book 1 for Oboe, & Tuner & Metronome. Essential Elements for Band Book 1 offers beginning students' sound pedagogy and engaging music, all carefully paced to successfully start young players on their musical journey. EE features both familiar songs and specially designed exercises, created and arranged for the classroom in a unison-learning environment, as well as instrument-specific exercises to focus each student on the unique characteristics of their own instrument. OB402 Artist Series Oboe with Case, Oboe Care & Cleaning Kit, Music Stand, Band Folder, Essential Elements Book 1 for Oboe, & Tuner & Metronome. OB402 Artist Series Oboe features a full conservatory key system and a range to low Bb for the advanced player. The high quality resin body resists cracking and offers a consistent intonation. Additional key features include left hand F key, F resonance key, auxiliary C, and C-D trill keys. The Oboe has Silver plated keys, tapered pivot screws which allow precise adjustment and blue steel springs. Oboe Care & Cleaning Kit, Music Stand, Band Folder, Essential Elements Book 1 for Oboe, & Tuner & Metronome. Essential Elements for Band Book 1 offers beginning students' sound pedagogy and engaging music, all carefully paced to successfully start young players on their musical journey. EE features both familiar songs and specially designed exercises, created and arranged for the classroom in a unison-learning environment, as well as instrument-specific exercises to focus each student on the unique characteristics of their own instrument. Since its inception in 2002, RS Berkeley has established itself as a global musical instrument innovator that designs, develops, manufactures and distributes musical instruments and accessories for the educational and professional markets. If you have any questions about this product by RS Berkeley, contact us by completing and submitting the form below. If you are looking for a specif part number, please include it with your message.